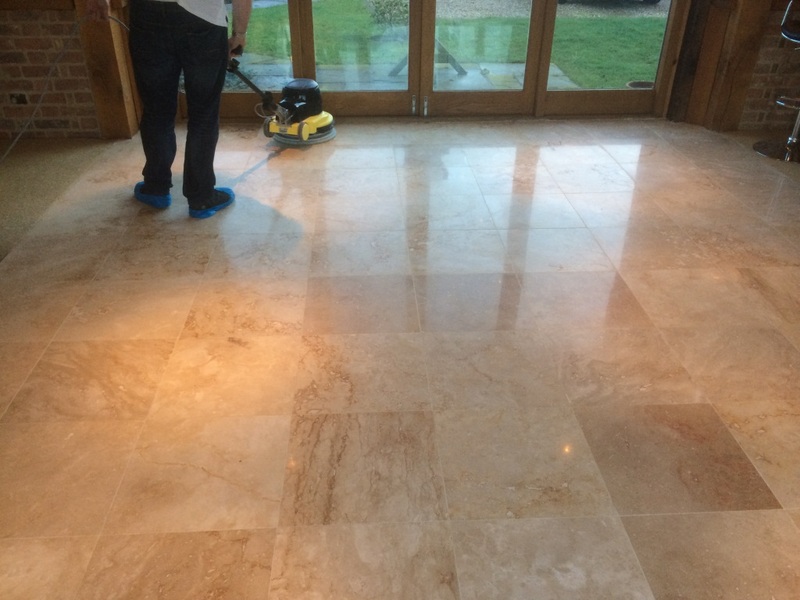 These Travertine tiles were laid five years ago at a residential property in Ashton Clinton and our client had never been entirely happy with the tillers finish from sealing which was marked with smears and also had the tillers bare footed prints embedded within the seal. The sealer was now wearing off and polish fading so it was due to be re-done and we were given the call. The owner had maintained the floor well so we set to work removing the old sealer using rotary machine fitted with a coarse number One diamond encrusted burnishing pad and a little water. The resultant slurry was rinsed off and removed using a powerful wet vacuum the grout lines were given a good scrub by hand using a stiff brush and Tile Doctor Grout clean–up. With the same method we cleaned and polished the tiles with the number Two and Three burnishing pads followed by a final clean and rinse and then left to dry overnight. The next day the tiles had completely dried we used the final number Four burnishing pad which is a very fine pad to polish and add shine to the travertine floor. 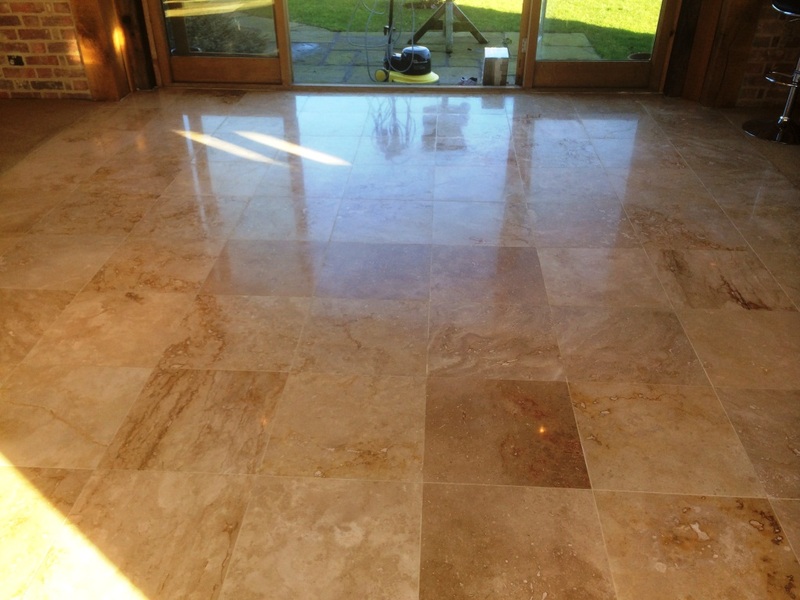 The last stage was to seal the Travertine which we did with two coats of Tile Doctor Colour Grow which is a colour intensifying sealer that brings out the colours in natural stone and provide lasting protection. 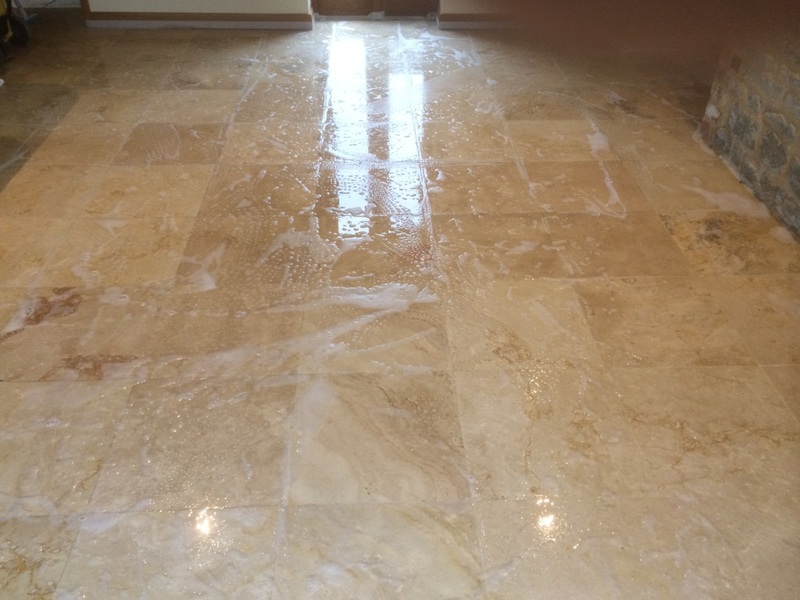 This entry was posted in Work History and tagged ashton clinton, cleaning services, floor restoration, polishing travertine tiles, porcelain tiles, residential area, sealing tiles, sealing travertine tiles, tile cleaning, tile maintenance, tiled floor, travertine tiles by AbzDominise. Bookmark the permalink. Choosing the right sealer is tricky, always best to get a second opinion.